Recently I bought this doll. She's the first one I've ever seen. 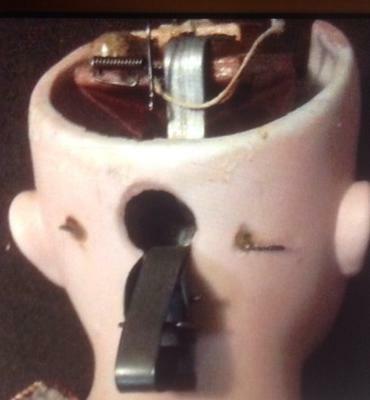 This doll has a wood voice box, sitting inside her head, with a lever at the back of her head to make it work. Now, the voice box isn't working I'm told. What I would like to know, if possible, the basic value of the doll. I'm going to try and find someone to help me repair the voice box. If you know someone, I live in N. Florida. I would be very grateful for any info. I too have an AM with a voice box in the head - A61/2M 233. It is a very quaint character doll of som 14 or 16 inches. The AM book doesn't mention this doll but I have seen a picture of it in Reinelt Steiner : Magic of Character Dolls, Hobby House Press 1993. I don't know the value, I'm afraid ; I'm afraid to use the Antiques Roadshow site because I don't know how much I would be expected to pay. Does anyone know if the price is fixed, or does one pay by the minute? And how much? My voice box has a bellows-like little bit on the top, and one jabs at it with the hand. My doll then gives a rather weary squeak. I was able to get a picture of a working voice box. It looks like all im missing is a piece of fabric, and a wire. 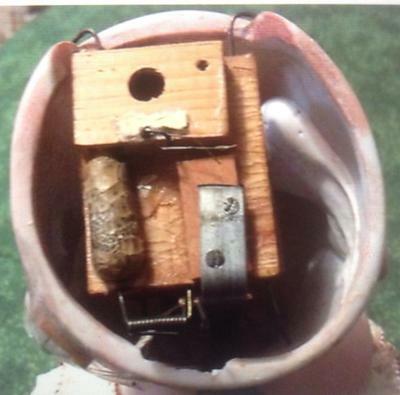 From what I can see, the wire attachs to the lever at the back of the neck, when its pulled, the wire pulls a small piece of wood over a piece of cloth? Thats what it looks like to me. At one point the french was crazy to make dolls do different things, and stiener did alot of strange things. Im sure this voice box sounds crude. If you go on the internet and type in the the whole numbers, it tells the name of the man that invented the voice box. Now, I bought the doll figuring it was worth alot. However, thats not the case. Some dolls seem to just not be in favor like others. Buyer beware, it pays to research. I assumed she would have value as there arent many around, but thats the problem, no one knows about them! Did you ever learn any more about this doll? Years produced? I also have one "with totally original" clothes and shoes, wig, but also a non-working voice box (probably because of age). Thank you. Join in and write your own page! It's easy to do. How? Simply click here to return to Armand Marseille dolls.